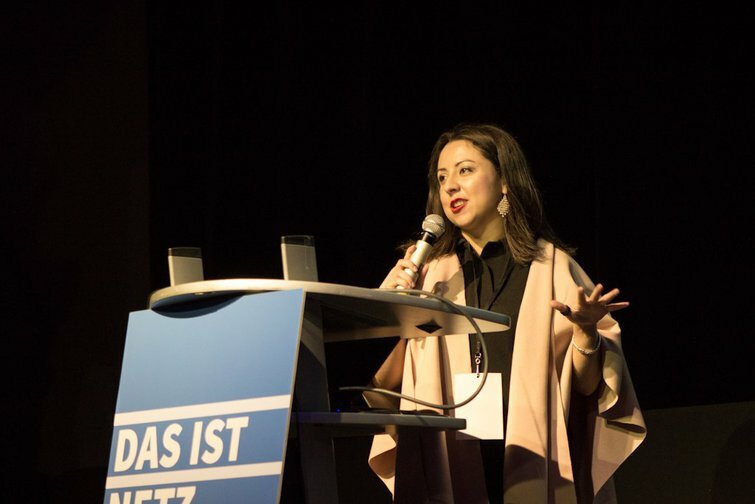 Renata Avila during a conference in Germany, October 17, 2014. Melanie Twele/Netzpolitik/Wikimedia commons. All rights reserved. For the topic of digital citizenship in the 21st century, I have had the pleasure of speaking to Renata Ávila, an international lawyer and activist and Executive Director of the Ciudadanía Inteligente (“Smart Citizenship”) Foundation. The number of projects and initiatives that she takes on are overwhelming, as are her ethical and political commitments. This electronic interview addresses a number of crucial issues, from human rights, to digital literacy, to the role of journalists. Read further for this illuminating fresco of cybercitizenship in the 21st century. ANDRÉS LOMEÑA: Contemporary societies confront all kinds of danger: neoliberalism, global warming, destruction of biodiversity, social inequality, and the deterioration of the welfare state and democracies. I am sorry to fall into a pragmatic argument, but I would like to know if you have a road map for addressing these problems. In your opinion, what actions, methods or risks should we prioritize? 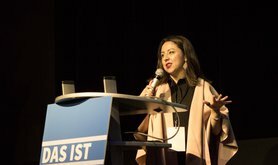 RENATA ÁVILA: To start, my road map would be to dismantle the three “superstructures” above individual states. They seem untouchable, and unmoving, even in the face of changes of command, coups, revolutions, crises and wars. Their dynamics are calculated, and their plan is for long-term, total control, converging in order to consolidate in a totalitarianism so sophisticated it is unprecedented. In fact, until Donald Trump’s election, they were very subtly in all spheres of people’s lives. There are three structures: the first relates to the framework behind international trade agreements, foreign investment treaties and mechanisms for global trade. The second structure concentrates the power of capital, especially offshore finance. And the third, and perhaps most dangerous of all, is an alliance between military power, the industry that surrounds it (contractors) and tech giants. An alliance of a new elite emerges from these structures, which as explained by the Transnational Institute in its 2019 power diagnosis, exercises a new form of sovereignty that is detached from territory. These corporate elites have certain characteristics in common, like storing their capital in tax havens, evading even a minimum solidarity in taxation, and increasingly distancing themselves from their countries of origin, so they cannot be neutralized by traditional means (like protests or elections). These superstructures neutralize citizen scrutiny via complexity and secrecy, often under the guise of national security, or via a rationale of economic strategy. 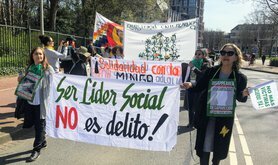 The first step in dismantling them is to form a global grassroots movement, with the knowledge that the problem cannot be attacked in an isolated manner: a series of decentralized, coordinated actions from the bottom can undermine the system before it consolidates, but we do not have much time. That is why on November 30, 2018, we initiated, together with the Sanders Institute and the Democracy in Europe Movement 24 (DiEM25), a global call to all world’s democratic forces, for unity and to stop this unprecedented consolidation of power. This is the starting point: for people to unite in action not only by country, but by continent. Today’s corporate sovereignty acts globally, without loyalty to any one state, seeing its sphere of action as the entire world, with the intent of not being noticed. The citizenry must demand its popular sovereignty back, burying the “corporate sovereignty” of today. For that, it is imperative to shake off the xenophobic and nationalistic distractions in order to focus on the real problem: how elites evade responsibility and scrutiny. We must focus on the elites and their populism so as to disrupt corporate sovereignty. To expose them, we have to show the degree of putrefaction and coordination they achieve for their benefit and at the expense of the rest. The mere existence of a global movement and its presence all throughout the world reminds us that there is the field of action, that this world you want to dominate at their utmost convenience, free from taxes or accountability, is in fact ours and we will defend it. A.L. : Authors like Joseph Slaughter have argued that the human rights discourses are a response to a neoliberal agenda. Wild liberalism appropriated the language of human rights and dismantled egalitarian and anti-colonial demands. Do you share this viewpoint? R.A.: I come from Guatemala, where there was a glimpse of democracy in 1944, but it was then crushed by a CIA-orchestrated coup a decade later, destroying the dream of a different system for a small, farming nation. Seventy-five years later, my people, very illiterate, suffering from chronic malnutrition, were crossing deserts, desperate for the promise of capitalism and welfare that never came. After a 36-year war, the genocide of four Mayan towns and a quarter of a million dead, those who wanted to free them now are building a wall to not let them in. The constitution is written and interpreted by one of the world’s most bloodthirsty and greedy oligarchies. A country co-opted by mafias. What do we have left? A framework of international human rights protections, and it is in the interest of the international community to make it work. Sometimes, it saves lives. Although I do not completely disagree with Slaughter, in this context and in countries like mine, appealing to this set of principles, agreed upon in the Universal Declaration of Human Rights, is often the last resort, and sometimes the only resource and protection to remind the international community about the suffering of their peers in these parts of the world. Another thing is the bureaucracy of human rights. I have experienced it first-hand, how consolidated organizations were so cautious about how and when to protect Western activists: they arrived late to the Chelsea Manning case, and late and inefficiently to the case of Edward Snowden. They are completely absent in these processes and when corporations massively reduce the economic rights of entire regions. There are many times when this suits them. But it is undeniable that the idea of universality and the principles crystalized within it are an unprecedented commitment, and a legacy we must defend and advance. A.L. : I would venture to suggest that digital citizenship has its own risks and challenges. I know Tim Berners-Lee works at Solid to provide users with more control over their own data.  WikiTribune is already underway, but I do not know if it is working as it was intended or if something more was expected from this initiative. 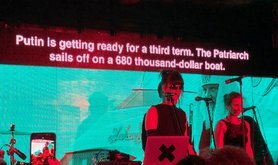 What projects seem to be the most promising, or where should activism and cooperation be directed? R.A.: It’s 2019. The World Wide Web is celebrating its 30th birthday, and the internet almost its half century. Are they new technologies? This past year it was estimated that half of humanity was connected. But what happens to the rest? Beyond the projects you mention, which are aspirin for greater problems, what keeps me awake at night, what worries me the most, and what I have dedicated a good portion of my book to, is a potential for the digital to replace a structure similar to colonial times, a system in which technology exercises inevitable control over behaviour, over the lives of the most dispossessed, without their consent and without their ability to choose to escape that control. World elites are eager to discuss strategies to hasten internet connection, for the maximum number of people to adopt technology at the maximum speed. They are competing for access to data that will be generated by the half of humanity that currently do not have access, in order to overcome rivals in matters of artificial intelligence. This will put them at the vanguard, with databases that only a diverse sample can generate. This is their primary interest, not necessarily human development, or access to knowledge and further democracy. Additionally, I am very concerned about and would like to emphasize types of technology, what the internet is connected to and what kind of technology the global poor are exposed to. Today’s disconnected are the world’s poorest, that live in war or extreme precariousness, oftentimes under authoritarian regimes, without access to minimal services and without a comprehensive understanding of how the rest of the world lives, how the world elite lives. How can we prevent connectivity from becoming an invisible electronic shackle, a way to monitor them, tag them, to regulate their behaviour? We are not talking about good guys collaborating in data verification, but about a population living in precarity, often in volatile social and political contexts. An example with painful lessons is that of Myanmar, a complex country that has not had internet access for several years. Its citizens recently gained connectivity very rapidly, with a service that offered access to a version of Facebook for free. Some might say that, following a military dictatorship, a digital platform serves as the perfect vehicle for a so-called “digital citizenship,” allowing for social reorganization, strengthening of ties, solidarity and sociability. However, the decision to favour a centralized platform with detailed profiles in a post-conflict country was miscalculated: Facebook’s architecture, which provides detailed profiles of its users, was leveraged to incite hatred and extermination of the Rohingya, leading to genocidal actions and the greatest displacement in recent human history. This was collateral damage, but the decision of the manner in which to connect the poor were made according to the long-term plans of technological giants, allied with governments, and the last to find out about this are the target population themselves. We should impose higher taxes on the powerful in order to tame financial systems and end inequality, as a way to provide for better democracy. A.L. 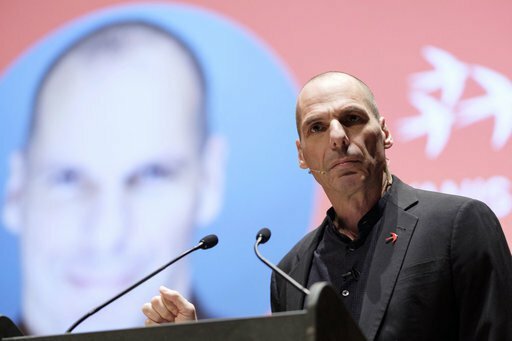 : The readers might not be familiar with DiEM25, the pan-European party led by Yanis Varoufakis and other intellectuals proposes a Green New Deal. What does this Green Agreement entail? R.A.: DiEM25 was born a couple of years ago as a pan-European movement seeking to restore democracy in Europe, and the Greek people’s will was crushed and ignored by an increasingly less democratic system. It has grown with a manifesto written by notable leaders and thinkers of our time, eventually subscribed to by more than one hundred thousand people. Given the progress of democratic projects and the incoherent response of traditional political parties, one of the objectives of the movement is, in addition to having an electoral component to participate in elections, to offer a space and extend an invitation to join forces with similar parties. In participating in the 2019 European Elections, the Green New Deal calls on different parties to offer voters a shared vision of Europe as a space for democracy, sustainability, prosperity and peace. For Europeans at least, it is the roadmap that you asked me about in the first questions. They have twelve pillars that compose a long-term vision for a new, sustainable lifestyle. The Green New Deal promotes a development model that takes into account the great challenges ahead: from the scarcity of natural resources, to the automation of the labour market or environmental destruction. One of the highlights of the Green New Deal is its investment program, which can be activated immediately without any need for a new body or modifying treaties. Within the current European legal framework, we can launch an ambitious pan-European investment program that, in five years, would constitute a tremendous impact on the change demanded by our economies. It is committed to the environment and job creation, investment in science and technology, etc. I repeat, everything would use the current structures, like the ECB and the European Investment Bank. In addition, my favourite part, of course, is the technological pillar. Europe has an important role to play that no one else will assume, to ensure that unprecedented technological advances help to simultaneously advance freedoms and rights. It is up to Europe to take the opposing role of what colonization has assumed in the past. It should. A.L. : In 2018 I have witnessed a strong anti-feminist movement, at least in Spain. I am not sure if you have experienced the same. Maybe so much media exposure can be understood as a political campaign to trivialize the movement, or as a final wave of the patriarchy. How do you view the current situation? R.A.: I am not very optimistic, and I don’t think it is the last of the patriarchy. The media represents one of the most powerful and representative arms of this patriarchy, and there have not been many advances. When I read the works of revolutionaries from the first three decades of the twentieth century, the struggle of today’s feminists, without trying to devalue them, they are bit tepid and disconnected from the struggle for social justice, for peace and for the people’s self-determination. I am particularly concerned about the few women who question, from a gender perspective, the superstructures I described above. The current situation necessitates diverse, critical views from within feminist movements, to prevent them from being consumed by individualism, or from prioritizing the victims of terrible abuses without really addressing the root problem of these structures. A.L. : You published a book with others about the great data leaks and the role of informants and whistle-blowers. I do not know if there are any plans for translation to Spanish. Regardless, I would like to ask you for some insight or advice as to how to train future journalists to summon sufficient courage and moral principles in such a complex media world. Your phone is a phone, use it as such and do not put it at the centre all of your journalistic or personal activities. It makes you predictable and locatable. It is where you place your contracts, your photos, your interview recordings, your sources, you family and your private life, all on a single device. The story that your editor wants to kill without further explanation may be important and relevant to the public interest. If you have evidence that will benefit people, promote rights or prevent abuse, provide it anonymously and securely to another medium. Do not leave us in the dark. If you are covering a war or conflict, do not forget to interview women, the elderly, and children. They are frequently those most affected by these situations, but those that we hear about the last. In doing so, you should be even more careful with your digital procedures and with securing consent for those who feature in your stories, which should always be express and informed consent. If you can, delete any metadata that could reveal information about your exact geographic location. A.L. : There are calls for citizen scrutiny, as well as intellectual and journalistic commitment, to fight against the advance of fascism. In Spain, there is a debate about whether to mount a quarantine against political options like the Vox party. Are you optimistic about citizen reactions? R.A.: More so than the absence of quarantines, these superstructures that I mentioned at the beginning are those that to a great extent allow, enable and feed the birth of undemocratic forces like Vox. For these structures, the more distributed and diverse power manifestations that still escape their control, the more difficult it is to achieve their consolidation, and that is precisely the challenge and the dream we are aspiring to with “Progressive International” and the European Spring. Rather than being united only through rejection of the anti-right project, we are extending an invitation to unite on a common front, with a plan, and without improvisation or ambiguity. We should impose higher taxes on the powerful in order to tame financial systems and end inequality, as a way to provide for better democracy. A.L. : One of my moral compasses has been Lawrence Lessing and his concept of free culture. What are your references or inspirational figures? R.A.: I learned a lot from my country’s elite, which are a brutish and crude version of the global elite: their tribal behaviour, their greed, how they deny fundamental principles such as equality, the racism and exploitation they impose on every level: how they deny that they actively facilitated the extermination of almost a quarter million indigenous people. The displacement of more than a million refugees and the stripping of entire villages of their land. It was more than enough inspiration to work towards seeking justice, thinking that a country of almost 16 million can regain control of power concentrated in the hands of only a few. I also have encountered inspiration in the group of indigenous women who survived the Guatemalan genocide. Likewise, in the families of the executed, tortured and disappeared: they served as life teachers and showed me my country’s dynamics. Ms. Rosalina Tuyuc, Mr. Tiburcio Utuy, Jesús Tecú, la Premio Nobel Rigoberta Menchú, Ms. Aura Elena Farfán, Helen Mack, they were people who fought for decades against impunity and who today are under threat yet again, but continue fighting. I am also guided and inspired by all those spaces where, despite linguistic, cultural, economic and social divides, people untie and act for something that goes beyond borders, like movements for universal justice, the cypherpunks, Wikileaks, the whole whistle-blowing ecosystem, and like you, the open access movement and a culture of freedom. A.L. I congratulate you on your perseverance in the face of doomsayers who comfortably criticize political struggles, when they have never been involved in a cause. R.A.: I believe that having a more democratic and diverse European parliament is a good “quarantine” (I am borrowing the phrase from the previous question) to contain the democratic deterioration of Europe, and to restore hope. It is a great responsibility, and now there are real options to propose instead of fear, which provide inclusion rather than isolation.